Harare - Knowledge Musona says people should not judge him by his recent stint with Belgian giants Anderlecht. The national team captain experienced a frustrating outing before he was loaned out to bottom-of-the-table side Lokeren. The Warriors skipper spent only six months into his four-year contract when he was loaned out by the 34-time Belgian Pro-League champions. 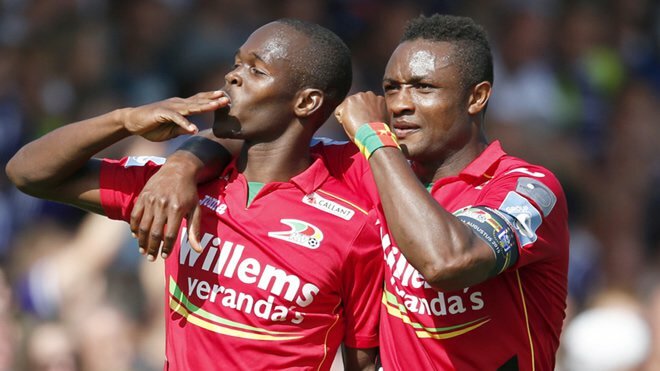 The Zimbabwe captain was unhappy that he was not given enough ground to prove himself at Anderlecht. “I had to leave Anderlecht this winter because it’s very hard to train and not play. It’s frustrating not to be in the team. And if you do not play, you do not have confidence. I do not think I failed at Anderlecht, I did not just get my chance. “People cannot judge me during my stay in Anderlecht because I have never been able to show myself. I hope that this loan will allow them to come to the conclusion that I can bring something to the team,” he told Belgian newspaper Het Laatste Nieuws. Musona arrived at Anderlecht with high hopes. He had an impressive resume that boasted of 18 goals and 41 assists at his previous club Oostende. The Aces Youth Academy alumni has also been at the forefront of the Warriors’ campaign in the 2019 AFCON tournament after getting the team closer to Egypt with his four goals in the qualifiers. But he could not nail down a starting place in the Anderlecht side under their previous coach Hein Vanhaezebrouck, who was apparently sacked last month. Musona made only eight appearances and as a result was overshadowed by Belgian Landry Diamata (13 goals) and Ivan Santini of Croatia (11) who are currently the club’s leading scorers. His last league appearance dated back to the end of October. “The fans did not even see the real Musona. Under the previous coach, I did not get enough chances to prove myself, it’s unfair to be judged and you have not played five games in a row right from the start, because that’s the only way to build confidence and get to understand each other better with your teammates. “The coach did not plan with me. You have to ask him, I have to accept that, it was difficult to train and not to play games and frustrating that sometimes I was not in the selection. “If I wanted to play, I had to leave the club, so I decided that, after the season, I’ll basically go back and they’ll have to decide if I have any future at Anderlecht,” said Musona. His new team slumped to a 1-4 defeat at Eupen. Lokeren coach Trond Sollied said he believes the forward will make a difference in the team.